Pharmacy and Gardens toast Anton Swords new release "City of Oblivion"
Pharmacy & Gardens will be performing a short and sweet set Monday night at The Small Beast. 8:45 PAUL WALLFISCH ...will not be playing the accordion at this show. But here he is, doing it in Cologne, Germany. 9:15 AND THE WIREMEN Somehow both etherially delicate and provocatively course, ex James Hall axe slinger Lynn Wright's songs, abetted by the magnificent trumpet playing of Paul Watson, (Sparklehorse), are a unique treat. Come join Pharmacy and Gardens and friends for an intimate evening in the beautiful back space of Pete's Candy Store. This will be a low key evening featuring the country joy of Yuri and Dan, the melancholy romanticism of Pharmacy and Gardens, and the explorative Americana of Lyndon Roeller. Bring your friends. Relax. Sit and take in some songs. First gig in New York since the summer tour of Switzerland. New songs, and a shattered spirit. 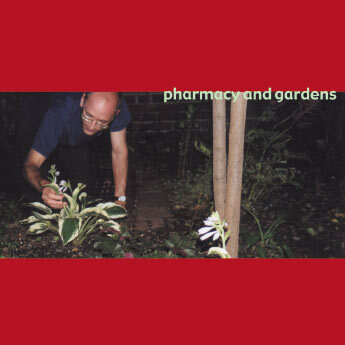 Pharmacy and Gardens. Our medicines are as varied as our ailments. There is a wealth of each, intricately bound to each other. All songs ©1996—2001, Broken Hill Music. All rights reserved. Used by permission. You can buy this beautiful album via PayPal for the low price of just $9, plus $2 shipping and fondling. The interiorized Rousseauian self decides this might be good as a first song for an album. The other selves disagree (of course) , but can't really argue with it. And then Jesus comes. A very slowly opening morning. Michael Hart-Vanhouten played the bass and the beautiful drum track. Kristofer Widholm: vocals, guitars, effects. He is the superintendent of a Lower East Side building. He wears cowboy shirts and boots. From his kitchen, he is digging a tunnel underneath Manhattan. Includes a sample of Marlene Dietrich singing "Lili Marlene." Kristofer Widholm: vocals, guitar, dissonant piano. Performances, ringworms, kisses and alcohol mingled into something ephemeral that still manages to make my heart sick. Regret as goofy as you can get, yet still regret. Kristofer Widholm: poorly played drums, poorly played mandolin, guitars, vocals. In the alchemy of grieving, glyphs and symbols can help keep track of what you're mixing together. Just be sure to hide your notebooks from the authorirites. Produced by Kristofer Widholm and Broken Hill Music. Recorded at Broken Hill Music studio Roland, Brooklyn New York. Thanks to: Roman Elsener, Peter Beyer, Michael Vanhouten, and Shahzad Ismaily, for help and encouragement. Cover photo by Philippa Kaye.